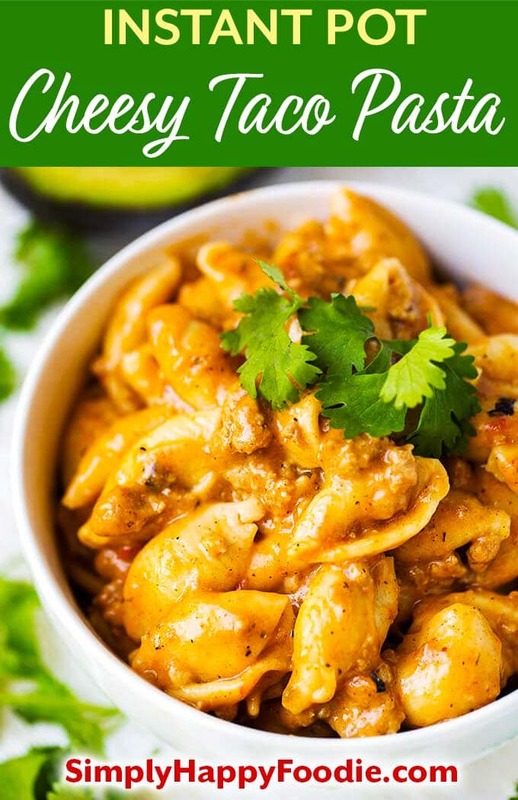 This Instant Pot Cheesy Taco Pasta has only 6 ingredients, cooks in under 30 minutes, and is delicious! This pressure cooker cheesy taco pasta is one of my most popular Instant Pot pasta recipes! Today has been a day of speed related events. My blog was running very slow, and people were telling me that they couldn’t get on! Yikes! I had to switch hosts, and hire a guy to dig in and figure out why it was so slow. 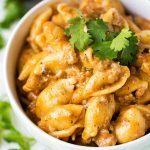 I had already decided to post this Instant Pot Cheesy Taco Pasta today, and it is a fast meal, so it was fitting! Every time I cook pasta in my Instant Pot electric pressure cooker, I am grateful that this wonderful appliance exists! It is great to cook the pasta in broth and have it soak up all of that flavor. It is even better that you don’t have to drain it! The flavor for this pasta dish comes from salsa and my homemade Easy Taco Seasoning (or use the packet from the store). So simple, and so much flavor! Garnish with chili fixin’s, or serve as is (which Paul prefers), and it will be a hit with the family! I just got a message that my website is fixed! Yay, that was FAST! Enjoy Instant Pot Taco Pasta on its own, or with your favorite garnish. Some of my favorite garnishes are avocado, sour cream, cilantro, and hot sauce. This Instant Pot Cheesy Taco Pasta has only 6 ingredients, is ready in under 30 minutes, and is delicious! Turn pot on to Sauté mode. When display reads Hot, add meat (use a little olive oil if using ground turkey). Cook until mostly done. Add the taco seasoning, stir and finish cooking meat. Add the salsa and broth. Stir. Put on a glass lid (or any lid that fits. If you use the pressure cooker lid, make sure it is on Venting). Let the broth heat up and start to simmer. Add the pasta and stir. Put the pressure cooker lid on and set the steam release knob to the Sealing position. Press the Manual (or Pressure Cook) button and use the + or - button to select 5 minutes for softer pasta, 4 minutes for more al dente (or half the time on the pasta package directions). When cooking cycle ends, turn off the Instant Pot. Do a controlled Quick Release of the pressure/steam. I like to start it in smaller bursts until I am sure no sauce will be spewing from the steam release knob. Then I turn the knob all the way to Venting, and let it release the remaining steam/pressure. When the pin in the lid drops, and it is safe to open it, do so with the lid facing away from your face. Give the pasta a good stir, add the cheese, stir again, and serve. This came out perfect for tonight’s dinner! My husband was raving about how delicious it is and had 2 bowls. This would also be great for potlucks. This recipe is definitely a keeper! Yay! So glad you all like this recipe! Thank you for the nice comment! My family loved the recipe and for this Instapot newbie, it was very easy to make. Super tasty and a meal all ages can enjoy. It will definitely be part of my meal rotation. We love this and I’ve made it several times with various shapes. Every time the pasta is too soft though. I reduced the pressure time to 4 and still too mushy! Would reducing the amount of liquid help make firm pasta? Hi Kristin, it depends on the type of pasta you are using. The shells I use normally are perfectly done at 5 minutes, but a more delicate pasta might only need 3 to 4 minutes. The rule of thumb is half of the time the package directions calls for. And a quick release of the pressure. I’m glad you like this recipe. Maybe play with a few different pastas if the one you have used isn’t working out. 🙂 Did you use 12 ounces of pasta or 16? If you aren’t using the shells, maybe use 16 ounces of another type, and yes, you could reduce the liquid. Just keep enough to bring the pot to pressure. Do you know long for gluten free penne? Hi Catherine! A general rule of thumb for pasta in the IP is half of the time the directions on the package says. I cook 1 minute under, just in case. That way if the pasta comes out al sente, I can let it sit a few minutes to soften up, then know to add that minute back the next time. If it comes out mushy, I know to subtract a minute for next time, etc. You always have to make it that first time to get your baseline! Thanks for the question & the response! I’m making this recipe this weekend (It’s Instant Pot Friday! LOL!) & I bought GF pasta made from chickpeas. I can’t wait to make this one! It looks easy & super yummy! I kind of cheated as I thought I had to rate & I gave it a 5 before I actually made it. But how can it not be – it’s in the IP, it’s cheesy taco! Hi Sandy! Thank you. I’m glad you like it! Can you substitute tomato sauce instead of the salsa? Thoughts? Hi Darren, you can, but the flavor will be less intense. Add the tomato sauce very last and don’t stir it in. Then close the lid and cook as directed. Tomato sauce is often the cause of the dreaded burn message, so by leaving the liquid as thin as possible, you can hopefully avoid that. I hope it works for you! New to using the instant pot….When you sauté the ground beef, do you have to drain the grease? Hi Krista, yes, if using less that 93% lean. It’s kind of a personal preference, and I would leave in some of the fat if I was going to add onions to sauté. But I wouldn’t like much grease in this recipe. This recipe is delicious! It’s perfect for someone new to the instant pot as well a a seasoned professional. My kids love this meal and it’s a great go to for busy nights. Hi Emilie! I’m so glad you and your kids like this recipe! Thank you for your review! Oh no Jennifer! Here are the typical reasons you might get the burn message: 1) Was the ratio of pasta to water/broth correct? It’s important to get this right as the pasta absorbs the liquid, and we don’t drain it. I weigh my pasta as that is the most accurate way to measure it. I try to give cups, too, so you can measure that way. It works when using the same pasta I did. 2) Did you scrape the bottom of the pot (deglaze) after cooking the meat? You don’t want to leave any browned bits on the bottom of the pot. 3) Was your silicone seal properly in place, as well as the steam release knob? Once in a while this is the culprit and the liquid evaporates. I hope this helps. I also have a video of me making this recipe, it’s above the recipe card. I hope it works out next time, it really is good. Thanks for your response. It may have been that I used rotini. I don’t know, everything else I did correctly! Thanks so much! 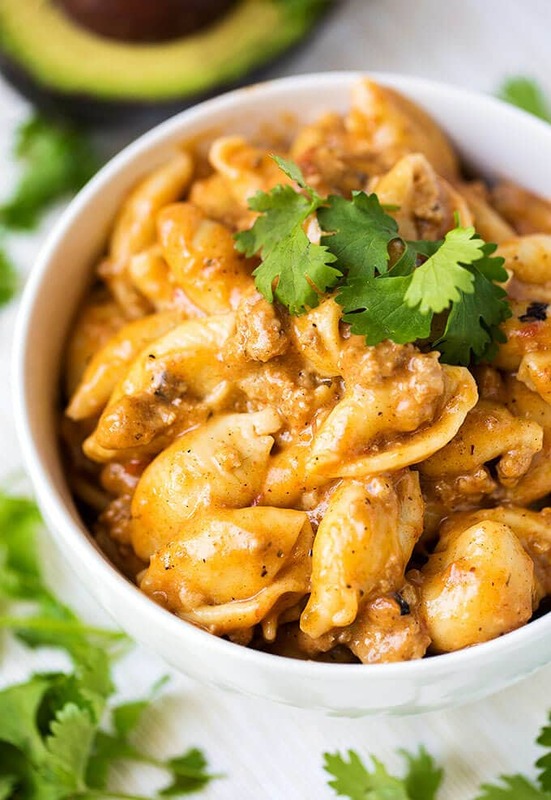 This is the best and easiest instant pot pasta meal I have tried yet. Kids loved it. Came out perfect. I used 1.5 pounds lean beef and taco blend cheese. Delicious! Thanks for the recipe. Hi Erin! This is always a hit with our grands, too! I’m so happy that you all liked it! Thank you for your review! Any tips on how to recreate without an instant pot? Sounds delish! Cook the meat mixture in a pot on the stove. Cook the pasta in a separate pot. Then mix them and add the cheese. I would like to half recepies and cook in 3 quart inst.pot. would I half cooking time? Hi Anna, no you normally would not reduce the cook time, unless the cut of meat is smaller/thinner. Do you think you can do this recipe without the cheese at the end? My husband does not like cheese but want to try something different instead of plain tomato sauce and ground beef. Yes, it’s still very tasty without cheese. It will be a little thinner/saucier. I don’t add cheese to the pot, I add it to the dishes once it is served. I find it makes clean up of the pot easier. lol I’ve made this several times and my family all love it. Any thoughts on using frozen ground turkey? Or should I thaw it out? Hi Heidi, I use ground turkey (93% lean) often for this recipe! I do thaw it first. I canNOT believe how yummy this was! I’m not very skilled in the kitchen (!) and am new to the instapot world. This recipe killed it! So Delish. And with the easy homemade taco seasoning?!? Amazing. Add avocado to the top – finished it perfectly. Thanks for keeping the instructions simple and clear! Hi Jodie! Yay! I’m so glad you liked this Taco Pasta recipe! We love it, and so easy. Thank you for your review! Omg, this is my new favorite Instant Pot recipe! My mom made it and raved about it to me so I had to try it right away, and I’m so glad I did! Absolutely delicious and so easy. Thank you for the recipe! Needing to feed a large crowd. Do you think you could double this recipe? If so, would you cook the same amount of time or add some? Hi Courtney, I think in the 6 quart you could make half again as much, but I’m not sure about doubling it. The quick release could spew starch from the vent. If you do, do a controlled quick release and that will reduce the risk of the volcano! Sounds awesome, but it’s just my husband and me so if I cut it in half, do I cut all the ingredients in half? Or just the pasta and the liquid. I’m using a 6 qt. instant pot. Thanks!! Hi Linda, yes, you would cut all of the ingredients in half. The cook time remains the same. I expected this one to be great and I was not disappointed. I keep frozen browned hamburger meat in the freezer so this is a very quick recipe to make with that. The other slight variations I made were that I used Mexican blend cheese instead of the individual types and used beef broth instead of chicken. Hi Donnie! Thank you for the nice review. I’m so glad this recipe worked for you! This turned out sooo good! I threw this together for lunch and my kids loved it. I even made it vegetarian by swapping the meat for frozen black beans I had on hand. It worked great! Thanks! That’s great, Clarissa! So glad the kids liked it, that’s always a plus! Thanks for your nice review! SPOT ON recipe, once again! This is a great creation and following the directions from start to finish made a fantastic dish. easy to make, super tasty, and a real crowd pleaser. Thank you for sharing your invention with us, this will be a regular for us for a long time coming! Yum!! Thank you for this recipe. So comforting on a cold, windy evening. I halved the recipe for my 3-qt IP and it worked just fine. (Despite the fact that I forgot to cut the taco seasoning in 1/2… still delicious!) I added some diced onion while the meat was cooking and topped it with seasoned tortilla strips for some texture. SO simple. Definitely a keeper to put into the rotation. That’s great, Andrea! I have had a few people tell me that they doubled the seasoning, they like that spice! Thanks for your comment! Just opened and stirred cheese in! Looks delicious!! Super easy for a last minute dinner! I would like to make this with shredded chicken instead. Any suggestions on how to adjust the recipe/directions for that? Hi Meredith, just add everything except for the chicken and pressure cook it. Then add the cooked chicken and cheese. Stir, put the lid on until it warms up the chicken and melts the cheese. Great Recipe. Thank you for sharing this wonder dinner. The kids really enjoyed it. Awesome! I’m glad the kids liked this. Thank you for your review! This was delicious, and my picky boys (ages 6 & 8) asked for seconds and were also perfectly willing to eat it leftover the next night. My husband and I enjoyed it, too. Thanks so much! It was so easy and used ingredients I had in my pantry (although I had to use beef broth instead of chicken, since that’s what I had). 5 stars! That’s great! Kids really like this recipe! Thank you for your review! Hi! I’ve made this before and loved it. I’m thinking about making it tonight with leftover carnitas. Is it necessary to bring to sauté and bring to a simmer with the salsa and broth or should all of it just be mixed together? Thank you! I would try dump and start. That’s great, Amanda! Thank you for your review! This was my very first recipe using the insta pot. My husband asked for something with meat and cheese and found your recipe. It was a hit with both of us. I was nervous about using the insta pot, but your video was so easy to follow and understand. This is a keeper for us. Made this tonight and it sooooo good! 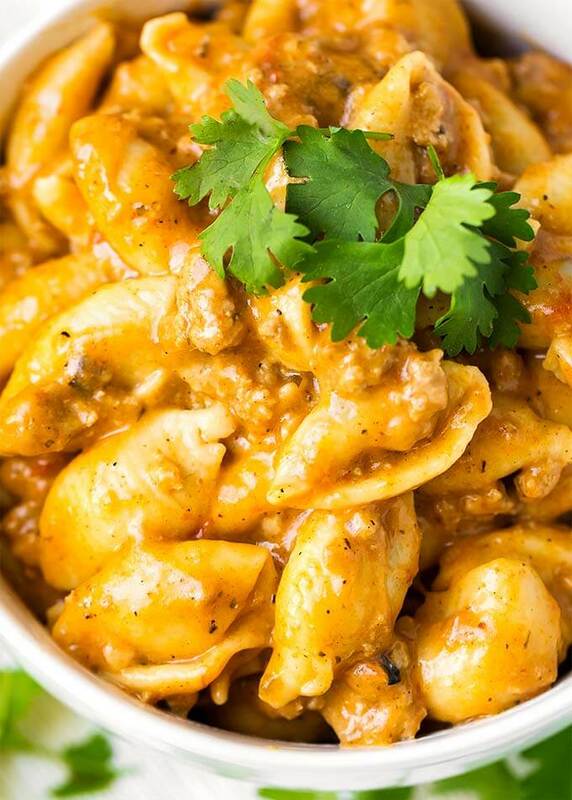 Now one of my favorite Instant Pot recipes! That’s great, Jess! Thank you! How long if I use 16 oz rotini pasta and can I substitute 8 oz bottle of taco sauce for the salsa? Rotini probably cooks in the same amount of time as the shells. I usually just halve the stovetop cooking time of the pasta. I think you can use the taco sauce. I haven’t tried that but it sounds good! I used Barilla veggie rotini to get some greens in the kids and 5 minutes pressure cook was perfect. There was still a lot of liquid after cooking, so I doubled the cheese and added some sour cream to bind. So simple yet so delicious!!! Definitely a keeper! This was so easy to make and turned out amazin!!!! I served with cilantro, avocado, sour cream and jalapeños. My boyfriend devoured 2 bowls and asked when I was making this again! Yay! Thank you for your review! I’m very happy to know that you and your boyfriend enjoyed this recipe!